Coordinating sheet set is adorned with applique and embroidered flowers on a pink hem. 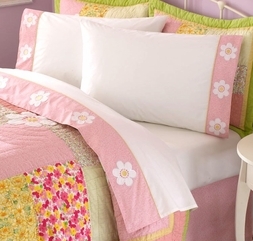 Set includes flat, fitted, and two pillowcases (one pillowcase in Twin set). Note: to use the Queen set on a Full-sized bed, simply tuck the fitted sheet.